As we wrap up the Easter Season, I find myself reflecting back on our celebration of Easter, better known as Resurrection Sunday, at Union Rescue Mission. 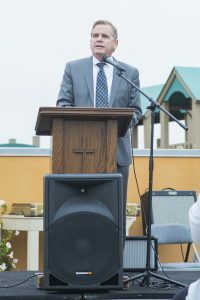 On March 27th I was asked once again to deliver the annual message at our Sunrise service on the Union Rescue Mission rooftop. The message-He is Risen-He is Risen indeed. It was quite an honor to celebrate Christ’s resurrection on our rooftop, but to tell you the truth, we celebrate the power of the resurrection every day at Union Rescue Mission. It is celebrated through scripture on our walls, through songs and messages in our chapels and bible studies. Most importantly, we celebrate the power of resurrection through the transformed lives of our precious guests. I eagerly get out of bed every morning and battle Los Angeles traffic to get to Union Rescue Mission as quickly as I can in order to participate in and see the life saving and life changing work that occurs inside the walls of this amazing place. I feel I have the best job in town. Little ones saved from hunger and the streets break into the biggest smiles and hand me Hearts of Love they have drawn and colored in. Join us today and help more people experience the power of resurrection, escape poverty and find their way home again. Union Rescue Mission needs you to finish 2015 well!! We are about to enter into our 125th year of serving people experiencing homelessness on Skid Row in Los Angeles. This year will be a very special one, as we are moving ahead in adding 13 units at Hope Gardens to assist 13 more moms & their children in overcoming homelessness. These 13 units will serve a special role as they will be a safety net for children of moms’ who may take a bit longer or may not ever overcome the obstacles keeping them without a home of their own. Other plans for Hope Gardens include paying off the $3.6 million dollar mortgage, making the elevators operational in all buildings & we may build small homes on vacant land & more units for our Senior Ladies. At Union Rescue Mission we are ready to retrofit all 3 elevators & make other needed capital improvements. Next year’s plans also call for a URM satellite out of Skid Row as we continue our strategic plan to multiply hope, regionalize services, & bring an end to the tragedy that is Skid Row. We are off to a good start on all of these new plans but none can proceed without a good finish to 2015. This good finish is complicated by El Niño & the now cold weather that has come early & the expected cold & wet storms predicted in our near future. We’ve added 140 cots downtown & these cots have been utilized for 223 days in a row. With the worst of the storms on the way, we may need to add 250 more cots or even find a satellite location now rather than later to get everyone out of harms way. These are added costs not planned in our budget & that is why we need your help. We need to not only meet our budget of $3.7 million in December alone, but we need to surpass the budget to keep up with the added costs of serving our precious guests in our cold & wet weather cots. Welcoming them at this critical moment could quite possibly put them on the path home to a transformed life. Take a moment to give a life saving life changing gift of any amount at urm.org by December 31st to help URM finish 2015 strong & roll into 2016 with great momentum. Every gift given by midnight December 31st will be matched/doubled. 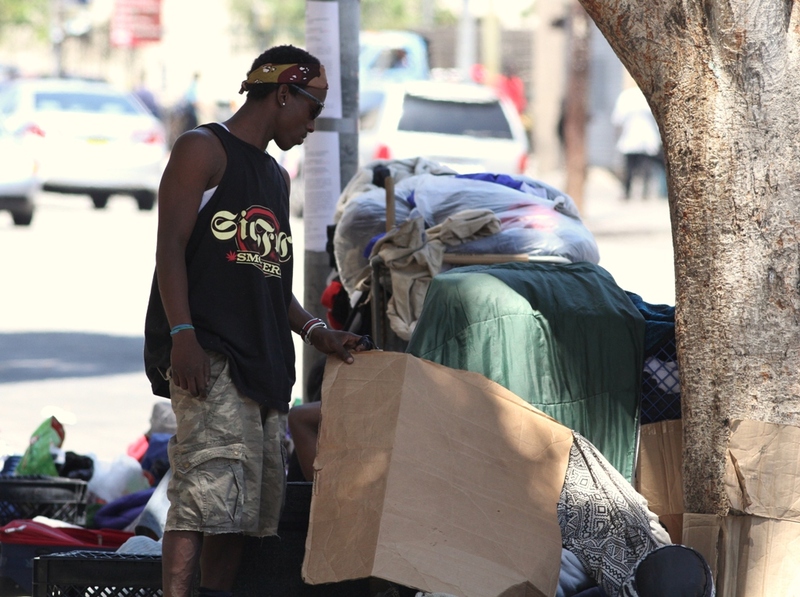 Six years ago, we at Union Rescue Mission put together 10 Steps To Address Homelessness in LA. We hoped to start a movement called Youarethemission.com to spur our friends to action. As I read these steps today I realize they may be more timely now than ever, especially in Los Angeles. Here is the 1st step, although today I might say & write; Change the heart of LA by changing the way we speak about people experiencing homelessness. Step 1: Change the way we think and talk about people experiencing homelessness. Too often we describe or label people as “the homeless” or “addicts” or “transients.” These are precious people, made in the image of God, who are currently experiencing homelessness. People should never be defined or labeled exclusively by their current condition. They are mothers, fathers, sisters, brothers, sons, and daughters. When we label people, we don’t see their potential and the possibilities within them. When we look the other way and ignore people, we dehumanize them and diminish their value. We need to look into our own hearts, change our thinking, and learn to recognize that “there, but for the grace of God, go I,” then ask, “What can I do?”Only then can we make a difference. I am so honored, we are so honored our friends at our marketing agency, Grizzard, have put this idea & words into a powerful video. 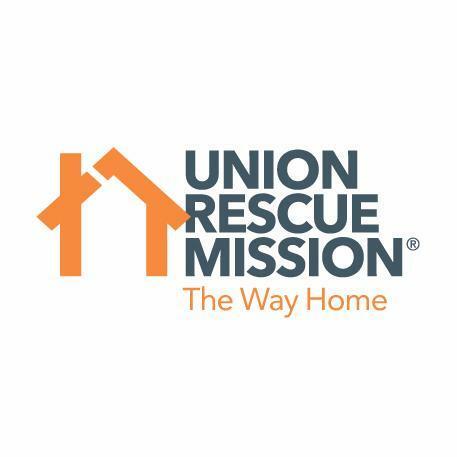 Just as The Great Recession became apparent through the exploding numbers of two parent & single father & increased single mom families, Union Rescue Mission made the decision to be guided by our history & The Lord & step up to meet the need. We opened up a 5th floor wing to make a place for this throng of families. Among the families, was a single dad, with a son & a daughter, he had recently been reunited with & rescued from foster care. We knew right away there was something very special about the 15 year old son, Kenneth Chancy. Despite, living in a van, going hungry, suffering the devastation of homelessness, experiencing the challenges of foster care, Kenneth was a straight A student, Student Body President, & the starting Fullback on the Varsity Football Team. Immediately, due to to Great Recession, the media descended on URM. When they came, they were very interested in this remarkable young man. ABC, CNN & many more interviewed this young man who had his sights set Harvard & becoming a brain surgeon. 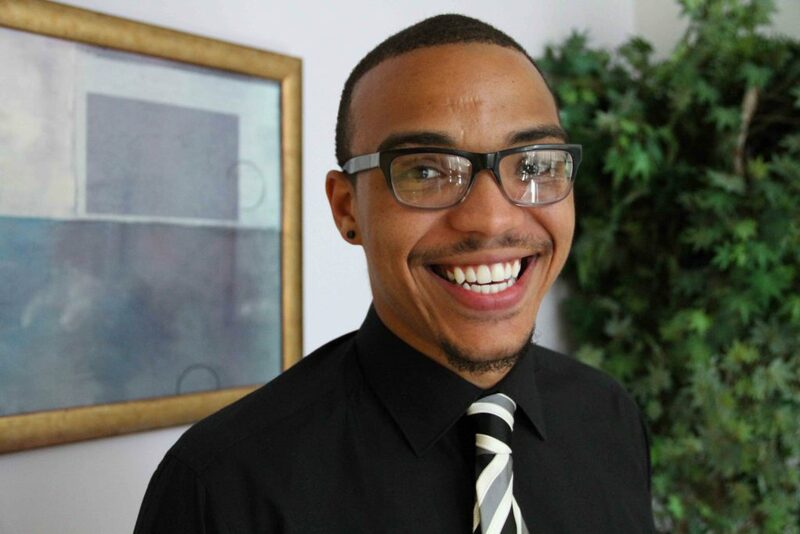 Kenneth was grabbed up by Dr. Sanjay Gupta, flew to CNN in Atlanta, & assisted with a brain surgery. He no longer desired to be a brain surgeon. He was introduced to NFL Star Nambdi Asomuogh, & was mentored by Nambdi & along with several other bright students taken on a tour of colleges all over the U.S. Along Kenneth’s journey, he befriended Mayor Antonio Villagarosa, Congresswoman Karen Bass, TV News personality Lou Parker, & many more. One day, Kenneth Found himself sitting with the Duke & Duchess of Tour, Now Prince William & Princess Katherine. URM’s own Kitty Davis-Walker, VP of Public Relations, served as an “Auntie” to Kenneth all along the way. Always looking out for him & connecting him with the opportunities mentioned above. I had opportunity to be his firm & loving Uncle at times. 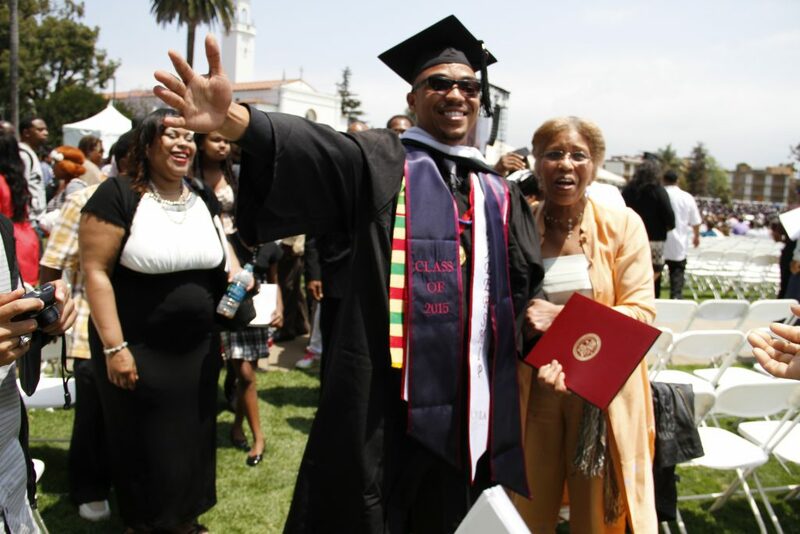 Two weeks ago, Kenneth’s journey continued as he graduated from Loyola Marymount University & his story was told around the world, including The Huffington Post & ABC World News Tonight. Kenneth was honored by Andre Ethier & The LA Dodgers on Memorial Day & we at Union Rescue Mission are honored to continue with Kenneth on his amazing ride. I am writing to you today with a heavy heart. As many of you may be aware and many of you have seen in the news, a resident on the streets of Skid Row was recently shot and killed in a struggle with the LAPD right in front of our building. It was a difficult day on Skid Row and we are still feeling the effects of this tragedy as we continue to do everything we can to be a light of God’s love in this nearly impossible and heart wrenching environment. 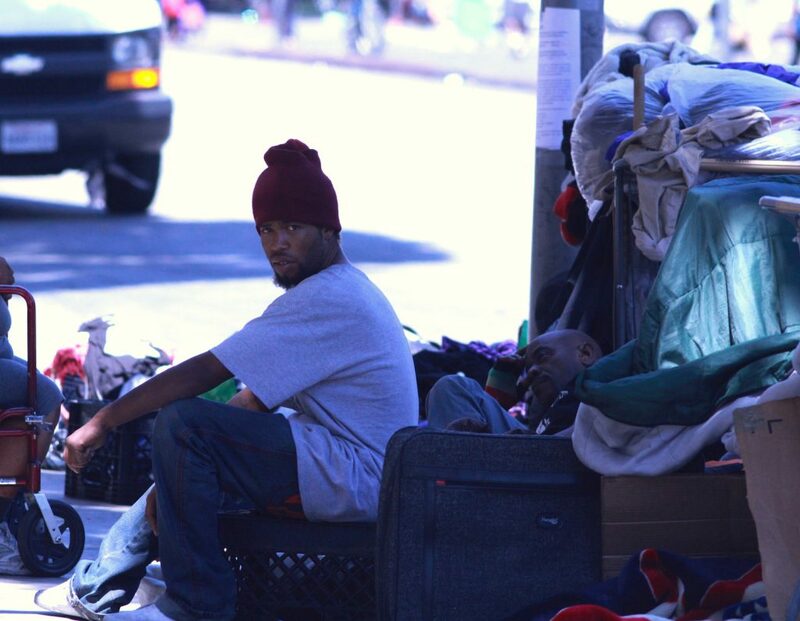 Why have we as the people of LA let this situation on Skid Row exist for so long? 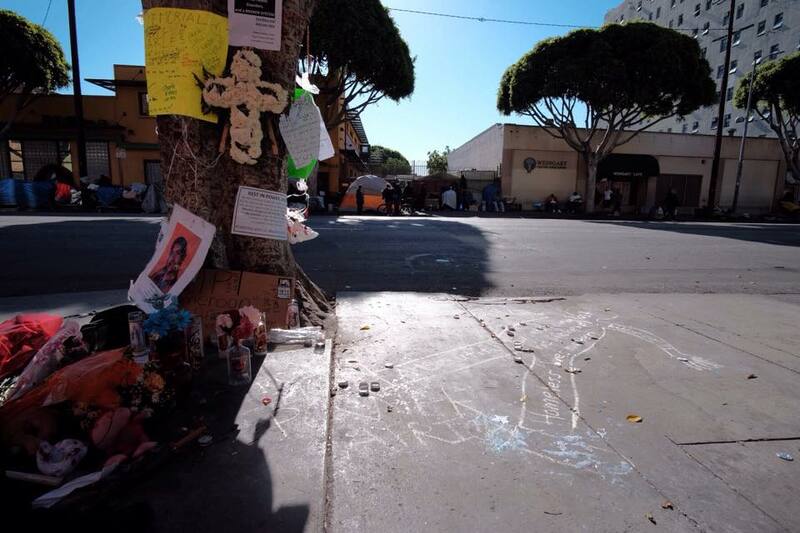 Really this tragic event is more of a reflection that we have a Skid Row, an untenable living situation, and police are trying to maintain peace in an impossible environment. Too often we sit back and only act when there is tragedy. The truth is, we all have a part in this and the time to act is now. There is a proverb that says, “The best time to plant a tree is 20 years ago, the next best time is today”. We can’t change the last 20 years of Skid Row, nor the last 120, but we can change it starting today. I am asking you to join us in prayer. There is exciting momentum in the direction to regionalize services throughout LA County and decentralize Skid Row. This will be done by encouraging and assisting local communities, churches, and cities to help their neighbors, brothers, and sisters experiencing homelessness in their own communities. The streets of Skid Row are no place to live and any continuance of this practice demands too much from the city’s law enforcement. My question remains – why have we let the situation exist for so long? It is time for the people of faith to lead the way in reversing this curse on our cities most vulnerable. Join us as we continue to pray together and strive to make a difference in this city. We have faith in the Hope that comes from Christ and together we will see that Hope come alive. I returned home 6 months ago from biking across Iowa then circling Lake Tahoe on our tandem on a charity ride and despite a wound boot was probably in the best biking shape I’ve been in the last 30 years. Then three flesh eating bacteria (likely from the streets of Skid Row) infiltrated my foot and nearly destroyed my foot and more. Well, I’ve ended up with lots of treatments and most importantly ended up learning patience and more by spending the last 6 months in a wheel chair. My first day in the chair while going to a meeting on Skid Row I was carrying a folder full of important papers in my lap. As I crossed the intersection, I hit a bump and dropped all the papers. As I tried to pick them up, the light turned yellow then red and a troop of fast cars and angry drivers began honking. Within an instant I became that guy in a wheel chair on Skid Row stopping traffic and hollering at cars! I’ve discovered ramps that were out of code, even at high end buildings. I’ve encountered many heavy, nearly impossible to open doors that are supposedly handicap accessible. There were plenty of bumps and cracks in the sidewalk and on the streets that will absolutely throw you out of your chair and onto the pavement. I’ve had a hard time making eye contact and getting service at restaurant counters and the other night at a local event, found it impossible to network with other folks who were standing around tables and talking. When the ball room doors opened, I found no way to pass by the tables and chairs in order to find a chair so I sat back by the entrance and felt invisible as I waved my hand when an award I was supposed to pick up for a friend was announced. Yet, the wheel chair had also become a bit of a secret weapon. I am able to approach people experiencing homelessness, especially if they happen to be in a chair, much more ably even than I could before. The other night as I was struggling up the sidewalk to get to a meeting, I passed hundreds of people and the only one who said “Hi, I’ll pay for your foot, sir”, was a man who was homeless and sitting next to a fence. On the way back from the meeting I was heading for a big hill to my car and a young man appeared from Pershing Square and asked if could push me up the hill to my car. His name was Will and he said he sleeps on the bench in the park. I handed him my card and some cash and invited him to URM. 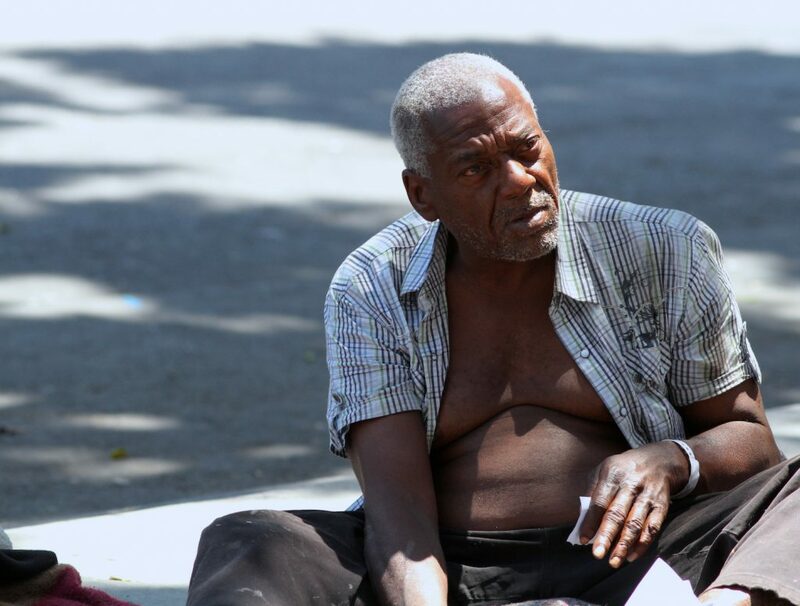 He followed me into the Mission, received a cot, then later joined our recovery program. I had foot surgery a couple of weeks ago and I’m hopeful of being upright again, at least in a wound boot or orthopedic shoes. But I am thankful for the experience. 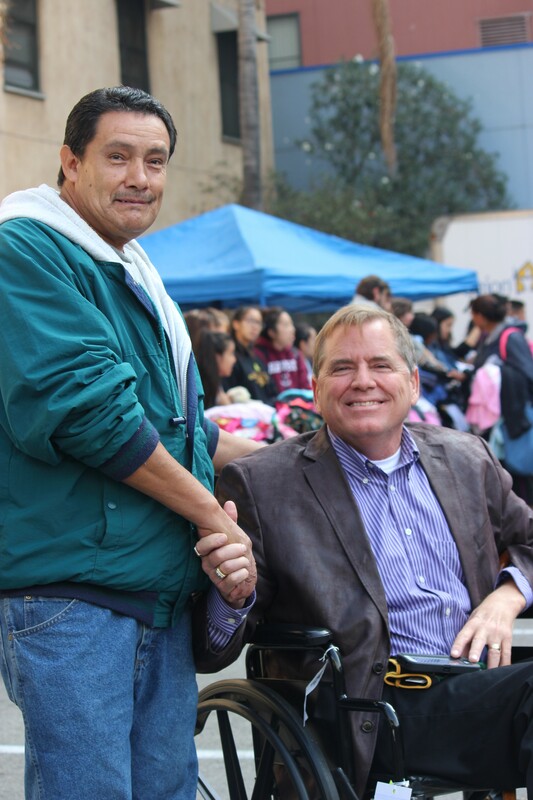 Many of our precious guests experiencing homelessness are disabled and face the obstacles I’ve described above every day. My weakness is my secret weapon. Dream with URM this Upcoming Year! We’ve just completed fiscal year 2013/2014 at Union Rescue Mission and when I say “we”, I mean you and all of our partners, providing the resources, lifting us up in prayer, joining our volunteer team, and spreading the word of the excellent life changing work happening here on the streets of Skid Row as well as out at our Hope Gardens Family Center in the Valley. These accomplishments, along with our everyday work of housing nearly 800 precious souls and serving over 2000 meals per day, would not be possible without your active involvement, participation, and sacrificial financial gifts. Thank you! This is what makes me excited about the future, knowing you and Our Lord stand with us as we take on what seems to be an impossible task. The task of caring for and reaching many whom the world has cast off. 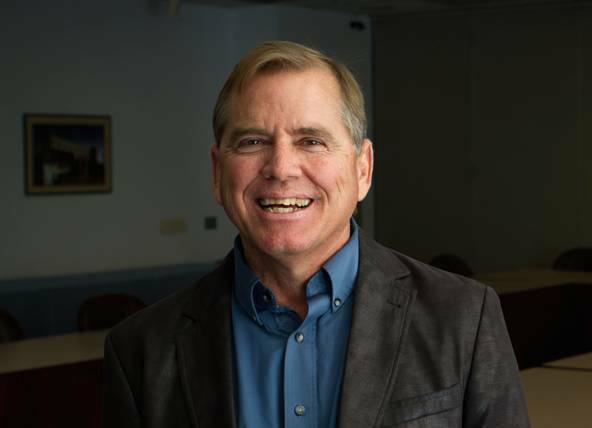 One of our chaplains, John Russell, preached in chapel recently that the kingdom of God is like a shade tree, a big shade tree that invites people forgotten by the rest of the world into the shade. I realized as he shared that this is URM, a big shade tree that invites the least and the lost of this world back into the shade, into a loving environment, into a life changing environment. Thanks for making this work possible! After 123 years of faithful service, we are not finished providing that shade, in fact, we are just beginning! 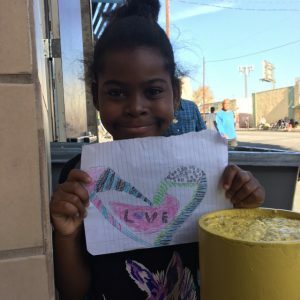 Our overarching goal for the next 3 to 5 years is to: Decentralize Skid Row by expanding our services in outlying communities while measuring and sharing the outcomes of our life transforming work. • Strengthen our team by providing appropriate staff pay increases for the 1st time since the Great Recession. • In an effort to decentralize services we hope to reach a capacity of 80% downtown, while reaching a capacity of 95% at Hope Gardens Family Center. • In an effort to look after children until they graduate from high school and move to college, we are investigating long-term restorative housing for families who after graduating Hope Gardens do not have the means to move on their own. • We will partner with Biola Professors to better measure and improve life transformation among our program participants. • In an effort to further strengthen recovery we are investigating an offsite men’s and women’s recovery program. I believe we will soon have the means to make this a reality, possibly in fiscal year 2015/2016. • We will continue to build our network by adding at least 1 key partner, like the incredible partnership with Pacific Coast Church of San Clemente, which mentors our men in recovery and holds Iron Man Conferences here at URM. We may enter into a local partnership with PCC helping them and another church establish a shelter in Dana Point in the future. 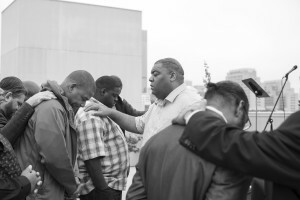 • We will establish partnerships with churches/agencies to engage neighborhoods which are producing most of our guests and the people on Skid Row. We want to strengthen young people and families, help them develop resilience to homelessness, to stem the flow into Skid Row. • We will launch a race/walk to raise awareness and funds to alleviate homelessness. • We will build reserves to 3 months of operating, and begin Phase 1 of a Capital Campaign to make improvements, i.e. new elevators downtown, and pay off mortgage of Hope Gardens. Though we plan to just begin this in fiscal year 2014/1015, my hope and belief is that this may be accomplished by fiscal year end 2015, and no later than fiscal year end 2016. These are some planned bold steps, as we maintain our vital work on the streets of Skid Row while branching out into uncharted territory, but we know our God is faithful, and we know you will continue to stand with us as a vital partner. We know none of our work could be accomplished without our Lord’s blessing and your generous gifts of love. Could you give your stamp of approval and your willingness to be part of the team that makes this happen by providing a generous financial gift today? Heroin is being sold and used. The same with crack cocaine. And a new, legal “spice” is being smoked – causing violence everywhere on the street every day. I’ve never seen so many precious people on Skid Row nor seen this level of mental illness, violence, and desperation. We need to take some bold steps. Last year, your year-end gift helped us strengthen our jobs program & just last month 7 graduates were hired through Toyota by DTZ & affiliated companies! We need your help again, and your partnership! 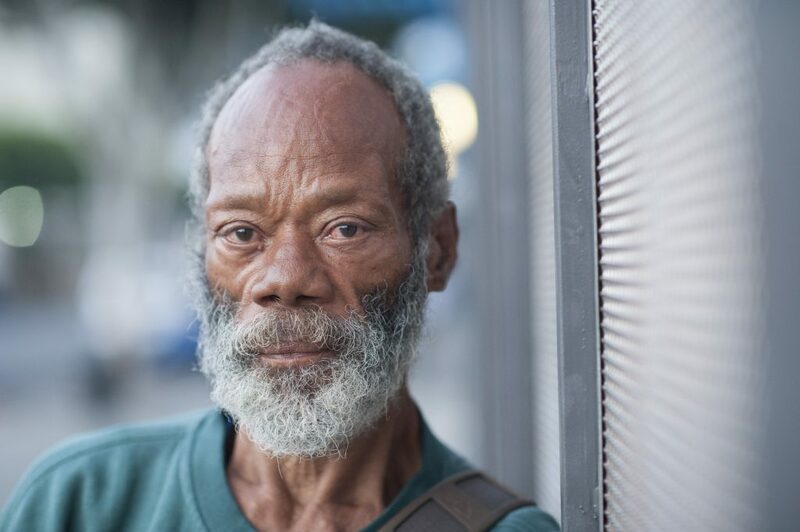 Union Rescue Mission will always be committed to serving the precious people on Skid Row. In addition, we want to add services in outlying areas to decentralize Skid Row and help people who have worked hard to get clean and sober stay that way. If we can raise sufficient funds to close out our fiscal year ending June 30th, we will have the resources and momentum to begin this strategic shift. Every gift given by June 30th will be matched/doubled! Build partnerships with several key churches that can not only be involved with guests at URM, but ultimately address homelessness in their local neighborhood with our help and support. Ascertain the neighborhoods sending people to Skid Row and partner with agencies to strengthen families and build resilient children to reverse this flow into Skid Row. Our everyday life saving and life changing work and these bold initiatives will only be possible with your continued partnership. P.S. Every gift you give until June 30th will be matched/doubled by other generous friends. We deeply appreciate and value your partnership. Are We Really Reducing Harm? I understand that the Housing 1st push to provide Permanent Supportive Housing along with The Harm Reduction Model (allowing drug use in the privacy of one’s unit within Permanent Supportive Housing) is being touted From Washington D.C. to Los Angeles as the latest silver bullet to end homelessness, but has anyone considered housing options for those who want to remain sober and reside in a sober and safe environment?